For all these years I have been a big fan of wooden combs, but very recently I have taken a liking to wooden Brushes. The natural wood bristles feel so good and therapeutic. They are perfect to stimulate and massage the scalp. This obviously increases the circulation, which means, yup…. you guessed it, more nutrients reach your hair follicle and improve growth. Also, the feel of wood on the scalp is very relaxing, like someone’s stroking your hair. That’s why I enjoy brushing my hair not just in the morning, but at random times in the day and before bed. I have found that it helps to de-stress and release tension, especially after a long day. And probably it’s a placebo effect, but I sleep better at night (if I brush before bed). Who should use a wooden brush? Everyone: any hair length, thin or thick, men or women will benefit from brushing with wooden bristles. It will improve your hair and scalp health with least effort. So if you’ve been using the same plastic brush you bought years ago, it might be time to upgrade. Here are 7 reasons why you should get a wooden brush…. The wooden bristles are like little massaging fingers on the scalp. They not just feel lovely, but they even help stimulate hair follicles to promote new growth. The massaging effect also boosts scalp circulation, bringing amazing nutrients to the hair roots. This, in turn, will make your hair grow faster and healthier. I like how well the brush glides through my hair. Since the bristles are wide and soft, they separate and manage hair easily without any pull. This means smooth, beautiful hair with less work! Of course, if you have lots of knots and tangles, its best to use wide-tooth wood comb – which is gentler, especially if you have curly and thick hair. As you comb, the wooden bristles work to distribute the natural oils from your scalp all the way down to the ends. Your own hair oils are the best natural conditioner! So distributing them from root to tip helps to keep the hair soft and moisturized. Expect smooth, healthy-looking tresses with luminous shine. Tip: If you have fine hair, and you want extra volume, flip your head upside down and brush from the nape of your neck to the ends of your hair. Unlike the plastic or metal pins, the wooden tips won’t scratch your scalp. So if you have a sensitive scalp, this is bliss. It may also help with dandruff, especially if your dandruff is due to dry scalp. A regular massage with a wooden brush will normalise the oil production and remove dandruff. Plus, it will also get rid of dead cells and flakes deposited on your scalp. Wood has a neutral charge, hence static is almost negligible. So those of you whose hair go wildly static after combing with plastic bristles can breathe a sigh of relief. Thankfully the wood bristles untangle and style hair without building an electric charge. And you can comb your hair in peace. What I also like about the wooden brushes is that they do not harm the environment – like the plastic ones. We all know plastic doesn’t decompose and so is filling up our oceans and landfills at a rate I’d rather not think about. 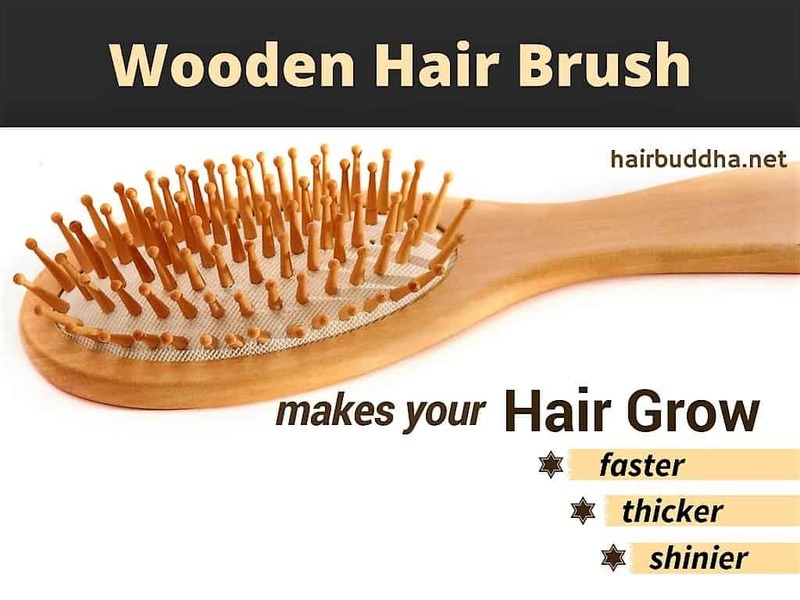 Wooden hairbrushes use natural materials that not only last longer and but also decompose a lot faster. How to Use Wood Brush? Like you would use a normal brush. Start at the roots. From there, work the brush through your hair to the tip. Comb every section of your scalp a few times. You can also flip your hair upside down and brush from the nape of your neck to the ends of your hair. Doing this will improve blood flow to the top of your scalp. Note: If your hair is too tangled, use a wide-tooth comb to remove any knots. Always start from the ends and moving your way up. How to keep the brush clean? Like any other combs, keep your brushes clean so you don’t transfer the grease back into your hair. Every time you wash your hair, take your brush/comb with you and give it a wash as well. You can use some soap and warm water to clean it. If it’s greasy or dirty, use an old toothbrush to scrub it gently. Also, remove any hair from the bristles (I use a bobby pin). I recently bought a paddle wood brush. And i love the feel in my scalp during brushing. But i just brush few times coz im afraid i will still have hair loss. My question… Is just brushing my hair enough or i still need to head massage? Coz i get so much hairfall during head massaging. Even during finger combing, i still loss some hair. So i dont like to touch my hair too much. Hi Sharon, brushing your hair should be enough. Also if you can, flip your hair upside down and brush it downwards. This will increase circulation on the top of your head. Thank you Minaz for sharing, I have just a brought blackstrap molasses for grey hair any advice. Hi Usha, just don’t overdo it. Let me know how it works for you. While I do have a little wooden brush that I enjoy using…I do just a few strokes as I have bald patches with thinning hair on an excessively oily scalp ! Brushing a little more or massaging could only stimulate the scalp into producing more oil ! Very tricky situation to be in as I struggle to save whatever little hair I have…and hairfall due to extreme stress. Hello Pratibha, I was in a similar situation as you. But over time the bald patches filled up. Of course don’t over brush as it will scratch your scalp and you don’t want that. But I am glad you spoke your piece as soon as you felt it. Such words from the heart should not wait for process or structure or system… they fly out and fall on hearts that need them so urgently. I am so glad you said what you did… I too read Rumi on Minaz’s pages and feel completely overwhelmed. My prayers for your departed sister-in-law. May she be in comfort with the Lord. That’s very heartfelt message, Sage. Before writing any post or email, I always ask myself how am I benefiting my readers, how can I make a difference. I am glad to hear that my work has touched you so deeply. Hello: I am so happy to hear about these brushes. I know they’re around but I’ve never heard if they were any good or not. I once saw in an ajur veda shop a scalp masager. I am certain it was from India. It was maybe a hundred thin metal threads or so with little balls on the end. The threads were tensioned just right and were bouncy. It had a handle on the top. and it was used manuallly up and down on the head for an amazing massage. I look on line for them but don’t see them. I have seen some cheep Chinese ”copies” but not wowrth much. Maybe you Miss. 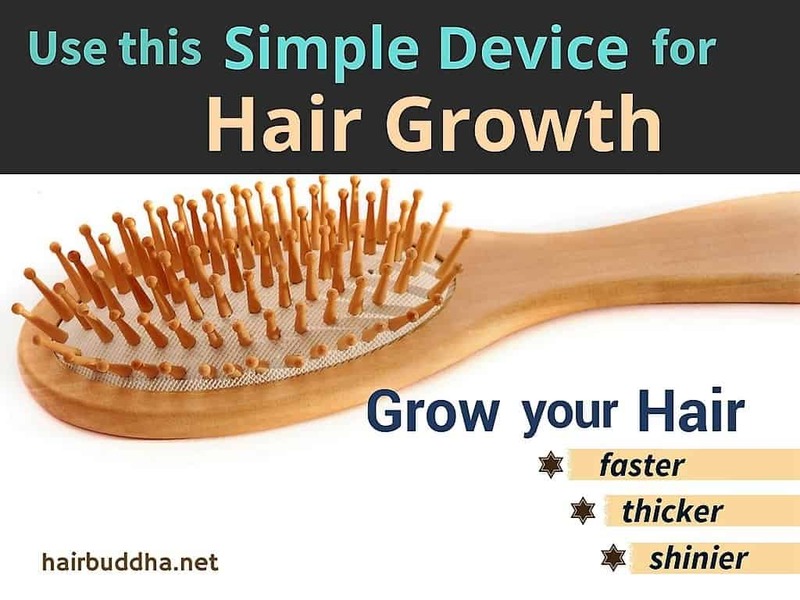 Minaz would know where to find these and sell these amazing scalp massagers on your site. Thank you for all your great tips. What if you have curly, dry hair ?? Curly hair by nature is more fragile and shouldn’t be washed everyday and if you brush through the curls, your hair ends up looking ridiculous and brushing can also damage the hair. What would you suggest for this hair type ? Simple massaging the scalp with the brush ? As I have mentioned above use wide tooth comb to remove tangles. You can use brush with extra long pins.